Chu Ge relates the final defeat of the prince of Chu, Xiang Yu,4 (232 - 202) at the hands of Liu Bang (247-195) in the struggle to overthrow and succeed the Qin dynasty (233-202). After the major battle at Gaixia, Xiang Yu fled, first getting lost at Yinling, then perishing in Wujiang; all are in modern Anhui province, with Wujiang being by the Yangzi River just a few kilometers upriver from modern Nanjing.5 After this Liu Bang went on to found the Han dynasty. In Shen Qi Mi Pu this piece is mistakenly grouped with the shangjiao mode melodies: its tuning should put it together with those in the qiliang mode. This mistaken placement is often followed in later handbooks. The version in Taigu Yiyin (1511) has lyrics throughout, but so far I have only been able to trace the source of the short song at the beginning: it occurs in Yuefu Shiji,8 where it is attributed to Xiang Yu himself. This poem is also included in Zhu Quan's preface (see below). Whereas Zhu Quan gives no attribution, Zheyin Shizi Qinpu (before 1491) comes up with Zhang Liang as the creator.10 Zhang was the advisor who persuaded Liu Bang that he could dishearten the enemy if his soldiers would sang the songs of their native state of Chu. In his analysis of Chu Ge,12 Xu Jian compares it first to Zhaojun Yuan in its form, suggesting these may have been transplanted from people's narrative songs. He points out the similarity of its opening theme (a harmonic passage), which recurs several times, with the opening theme of Yang Guan San Die. He also mentions the significance of using the non-pentatonic tone fa in certain places. He sang (this) several times, and Yu Ji joined him. Thus their tears flowed down, and all his followers cried; when none could look up at them, Yu Ji took a sword and slit her throat.15 Thereupon Xiang Yu mounted his fast horse, together with over 800 strong comrades under his banner, and went out into the night and broke through the blockade toward the south. (At daylight) when the Han soldiers realized this they chased them, and consequently his double pupils had no more hope. His soldiers scattered and his power lost, he came to Wujiang and, (refusing the offer of a boatman to take him across the Yangzi to safety, saying he had lost all his honor,) perished (also by slitting his throat). Someone of that time was moved by this affair, and wrote a qin song to commemorate it. 楚歌 15473.146 Song of Chu; the song heard by Xiang Yu's forces when surrounded by Han at Gaixia. According to Xiang Yu's biography, Shi Ji Annal 7 (RGH I/44-45), on hearing the singing Xiang Yu thought he was surrounded by countless Chu soldiers. He and his beloved Yu Ji then sang their farewell song, after which Xiang Yu and 800 horsemen broke away from the encirclement. There is no mention here of her committing suicide. Shen Qi Mi Pu includes Chu Ge after Zhuangzhou Meng Die, which is in Shangjiao mode. However, it is clear that Chu Ge should be connected to Shenpin Chushang Yi, which uses the same tuning as 淒涼調 Qiliang mode: tighten 2nd/5th strings: 2 4 5 6 1 2 3. For further information of modes see Modality in Early Ming Qin Tablature. The story of Xiang Yu and his beloved concubine 虞姬 Yu Ji was also related in the popular opera 霸王別姬 Bawang Bie Ji (The Great King Leaves Yu Ji, often translated as Farewell My Concubine). 5. Gai Xia, Yinling and Wujiang "垓下遺址 Ruins of Gaixia"
Although some tourist information is available about Gaixia and its environs I have not yet found any indication that there are any known sites reliably dated to the time of the battle. The Battle of Gaixia (Wiki) took place in 202 BCE. Chinese commentary to Shi Ji (I/333) says Gaixia was at 洨縣 Xiao County in 沛 Pei. The right closeup in Google earth shows a Gaixia Village (垓下村 Gaixiacun) in northern Anhui province about 50 km north northeast of 蚌埠市 Bengbu City and about 15 km east of 固鎮 Guzhen (3 1/2 hours by train from Nanjing?). It is between a 濠城鎮 Haocheng Zhen and a 霸王城 Bawang Town, with 韋集鎮 Weiji County shown about 3 km to the north and a Gaixia Old Battleground (垓下古戰場 Gaixia Guzhanchang) about 3 km to the northeast. 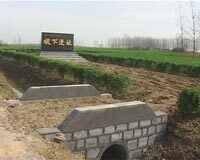 Another 20 km or so north of Gaixiacun, just east of 靈壁縣 Lingbi county seat, is an indication for a 虞姬墓 "Tomb of Yu Ji". The present account says Gaixia in a ravine. However, the Shi Ji account does not mention this, and according to the Google map and some online images such as the one to the right from Baidu this whole area has flat terrain. On the other hand an article on the Lingbi Government website, which describes visiting the site, shows an image that is perhaps a ridge. There are some websites, such as Baidu and China Hotel, that discuss various Gaixia-related tourist attractions, including the 虞姬墓 "Tomb of Yu Ji" (q.v.) and a "韋集鎮單圩老莊 Shanyu Ancient Village of Weiji County". After the battle Xiang Yu is said to have become lost in swamp near 陰陵 Yin Ling, then gone east to 東城 Dongcheng. My historical atlas shows Yinling about 50km south of Gaixia, northwest of the modern town of 定遠 Dingyuan. Google earth does not seem to include this name, but it seems to be located amongs some hills between Dingyuan and 蚌埠市 Bengbu. My historical atlas shows Wujiang by the Yangzi River about 20 km upstream (southwest) from Nanjing. 19454.79 says 烏江 Wujiang, now called 烏江浦 Wujiangpu (on Google maps 烏江鎮 Wujiangzhen), is a 水 stream and 縣 county in northeastern 和縣 He County of Anhui, adding that Xiang Yu committed suicide here. Google maps also show a 西楚霸王靈祠 Western Chu Great Conqueror's Shrine (for some reason calling it his Concubine Temple) by a stream called Four Horse Mountain River (四馬山河 Simashan He). Chinese Wiki has information under 乌江镇. From the account in Shi Ji Annal 7 (RGH I/46) it seems to have been a village on the banks of the Yangzi River. If Xiang Yu continued south southeast for another 50 or so km from Yinling, passing through Dongcheng, his route could have taken him by modern 滁洲 Chuzhou and ended here at the Yangzi upriver from the modern Nanjing. Also mentioned (see title of Section 1) is 江東 Jiangdong; 17496.142 says this means the same as 江左 Jiangzuo and 江南 Jiangnan, i.e., the south side of the lower Yangzi valley. However, Shi Ji says he was from 下相 Xiaxiang (宿城 Sucheng in northern Jiangsu), so perhaps Jiangdong refers to and that he was buried at 穀城 Gucheng, then part of 魯 Lu (northwesternmost Shandong?). In addition to having the first occurrence of the title Chu Ge, Seng's list also includes at least two other entries that may have the same theme, 楚歌行 Chu Ge Xing and 楚襄王 Chu Xiang Wang. Meanwhile, the list in Qinyuan Yaolu does not include Chu Ge itself, but it does have three entries using the same story: 楚襄雲 Chu Xiang Yun, 拔山操 Ba Shan Cao and 楚歌行 Chu Ge Xing. Zha Guide 10/99/149. See also the appendix below. The lyrics are included in the footnote below. They are called 力拔山操 Li Ba Shan Cao in Folio 58 (p.850) of 樂府詩集 Yuefu Shiji, a collection of ancient poetry compiled in the Song dynasty. 項羽 Xiang Yu's proper name was 項籍 Xiang Ji. This is the scene described in the Chu Ge illustration. Singing the lyrics from Section 1 of the 1511 Chu Ge serves well as a prelude, setting the mood for the music that follows. 「力拔山兮氣蓋世， Li ba shan xi, qi gai shi. 時不利兮騅不逝， Shi bu li xi, zhui bu shi. 騅不逝兮可奈何， Zhui bu shi xi, ke nai he? 虞兮虞兮奈若何！」 Yu xi, Yu xi, nai ruo he? These lyrics (translated in the SQMP Chu Ge preface above), can also be sung with the opening of the SQMP Chu Ge, Section 6. Although the pairing of finger strokes to Chinese characters does not quite follow the traditional pairing method, I sometimes sing them with SQMP because they are very appropriate to the slashing sound that comes shortly thereafter, in Section 7. The 1491 lyrics do fit by this pairing method, but they are applied to the whole melody and to my ears do not have the dramatic impact of the lyrics as applied in 1525. 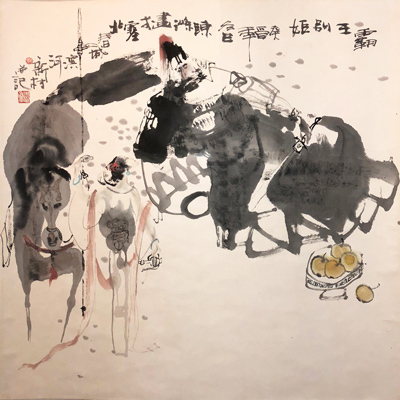 Zhang Liang, style name 子房 Zifang, is the subject of the qin melody 圯橋進履 Yiqiao [San] Jinlü (At the bridge, going down [three times] for the shoe), which tells of Zhang fetching a shoe which an old man dropped off a bridge. The old man, who turns out to be a sage, thereupon imparts the knowledge Zhang subsequently uses to become Liu Bang's chief advisor. Later melodies associated with Chu usually have a tuning which includes raising the fifth string from standard tuning. There have been no studies into the origin of this custom, and it must be noted that all surviving versions of Yang Chun and Bai Xue use standard tuning. 12. In Qinshi Chubian, Chapter 6b1-1 (pp.95-6). 13. In about 1976, when I was first starting to reconstruct a few old pieces, I privately heard the late 張世彬 Zhang Shibin of Hong Kong play Chu Ge. Its beauty further inspired my own interest in playing the old pieces. For the original Chinese text see 楚歌. She does this so that Xiang Yu will not worry about her during the upcoming battle. In the middle of Section 7 there is a sudden glissando in a high register that seems to represent a slashing sound. For the original Chinese section titles see directly below as well as 楚歌. The 1491 lyrics fit (but see comment on its Section 7 lyrics compared to those I have borrowed from 1525 for use here in SQMP Section 7). 1. 憶別江東; 2. 氣欲吞秦; 3. 夜聞鐵笛; 4. 八千兵散; 5. 英雄氣消; 6. 泣別虞姬; 7. 陰陵失道; 8. 烏江不渡. 1. 銜枚出塞; 2. 氣欲吞秦; 3. 夜聞鐵笛; 4. 塞土十年; 5. 英雄氣消; 6. 泣別虞姬; 7. 陰陵失道; 8. 烏江不渡. 1. ___; 2. 憶別江東; 3. 長驅關塞; 4. 鐵衣塵土; 5. 禾黍秋風; 6. 夜聞鐵笛; 7. 八千兵散; 8. 英雄氣消; 9. 陰陵失道; 10. 虞姬泣別; 11. 拔劍聲; 12. 烏江不渡. 1. 憶別江東; 2. 垓下勢窮; 3. 夜聞楚歌; 4. 起飲帳中; 5. 流涕長澘; 6. 八千兵散; 7. 泣別虞姬; 8. 陰陵失道; 9. 亭長艤舟; 10. 烏江不渡. 1. 憶別江東; 2. 氣欲吞秦; 3. 夜聞鐵笛; 4. 愈聞愈慘; 5. 八千兵散; 6. 英雄氣消; 7. 泣別虞姬; 8. 陰陵失道; 9. 烏江不渡. The above brings into question the relationship between such titles and the music to which they are connected: a title connected to one section in one handbook may in another handbook be connected to a section with completely different music. (1609; VII/149) A copy of 1589? (1670; XI/--) Handbook has is a Chushang modal prelude (XI/408), but there is no melody under it.